How Many Friends You Need At The DMV For An American Avantime To Fly? 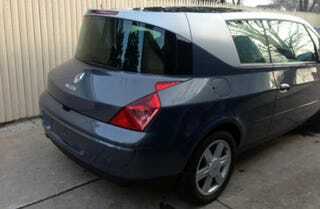 Apparently, there's a Renault Avantime in Farmington, Michigan that can be yours for $11,500. But how do you register such a car without waiting until 2026 to do so? I remember seeing a picture of a Peugeot 306 Cabriolet with California plates last year. Unfortunately, I can't seem to find that image at the moment, but I'm sure it exists, proving that nothing is impossible if you really want to drive a modern French car is the US. But apart from getting lots of favors from the right people, how is that even possible? This 2001 Renault Avantime comes with all the right bits expect for the tags. It has the V6, the manual gearbox and the tan leather. Now, all it needs is some love from the government. Being one of only 8,557 and the last car built by crazy race car/missile engineering firm Matra, few coupe-minivans would work better in America. Yet this one probably won't. If you show up at the Canadian border wanting to import a car on a bill of sale only you'd better have a waiver of title requirements (and either a registration document of a bill of sale from a bonded dealer) from the State the vehicle was purchased in. There's not that many States that have no title registration (usually age related) and Michigan isn't one of them if I recall correctly. AND, when you report the export to US Customs as required and you have no title they tend to have a complete sense of humor failure. As always though, the individual customs officers on both sides have a truckload of discretionary powers so you might get away with it. Might. That's almost as crazy as the Avantime itself, so it just might work. Might!